A few years ago, I designed several patterns for the webzine Crochet Uncut. This week I received a message through Ravelry about one of the patterns, claiming that the link was broken. Unfortunately, it seems that the site is now having some difficulty and all of the patterns are currently unavailable. I’ve thought for a while about transferring the patterns to one of my sites so they don’t become lost, and now seems like the time. Yarn: Lion Brand Magic Stripes [75% wool, 25% nylon, 330 yds/100 g skein] for small sweater (25 yds); Bernat Handicrafter Cotton Holidays Stripes [100% cotton, 138 yds/80 g skein] for large sweater (35 yds). Gauge: Gauge is unimportant in this project, as long as a close fabric is produced. Different hook and yarn combinations can be used to produce sweaters of different sizes. Rnd 7: Ch 1, sc in first sc and in next sc to marker. (Sc in marked st, skip sts between markers, sc in next marked st, sc to next marker) twice, sc to beginning of rnd. (26 sts) Do not join. Rnd 16: Sc around, sl st in 1st (marked) next st, finish off. Rnd 1: Join in armhole at underarm. Ch 1, sc around. (11 sc) Do not join rounds while making sleeve. Rnd 7: Sc around (5 sc) Sl st in 1st st of rd 6, next st, finish off. Finishing: Using needle, weave in ends. 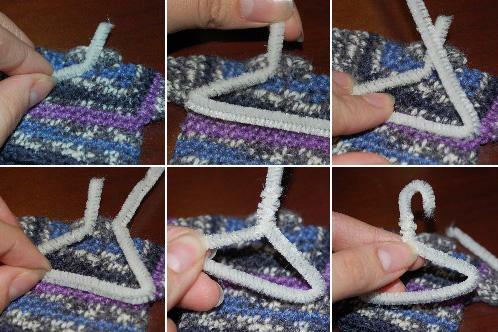 If desired, make hanger from pipe cleaner, following images below. How sweet is this! 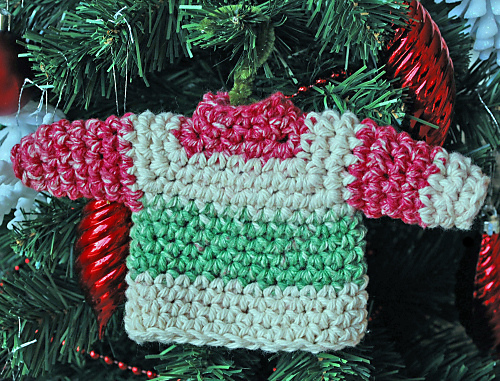 I’ve always loved the little knit sweater ornaments but would much rather crochet :-). So now I can! Thanks so much for reposting this! 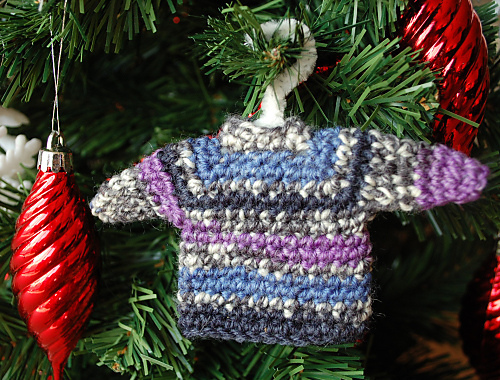 Thanks for your Mini Sweater Ornament pattern. I have been making these as holiday gifts and testing the pattern in different types of yarn weights. I even made a tiny Star Trek Shirt (Next Generation) with this pattern. I posted a picture of three finished ornaments on your facebook page.